So, I have had this project hidden for a few days to work on it some in secret without anyone knowing about, but I have made it far enough into the quest to make this official. This quest originally made by LunarWeeb, of whom I got permission to work on this quest from. This is my favorite quest on the database, so I aimed to change very little. The first couple areas are almost a tile for tile recreation of the original. Later areas take more liberty on changing things up, but I tried to keep the main general shape and intention of each screen. However, that doesn't mean this will be a carbon copy of the original. The bosses are mostly the same, as are the areas, but there are some new things. For one, I am working with the Vintage Dreams Tileset, so there are 4 button items. Jump is no longer tied to the L button. Instead, you have two items, one a regular Jump, and one a High Jump. The regular Jump can be used at any time, while the High Jump can requires magic. And you will never have trouble jumping if you're on a tile edge. I will be putting a large emphasis on making sure each area is fair for its intended progression in the quest. A lot of my remaining time will probably be spent on balancing difficulty and fixing the troubles I am having with magic running out too fast, and not regenning fast enough. So, what's new exactly? Apart from using GB sidescrolling style, several things. The entire map for Dungeon of the Fallen has been filled in. So a few areas were given an extra few rooms. There is also a brand new area entirely. 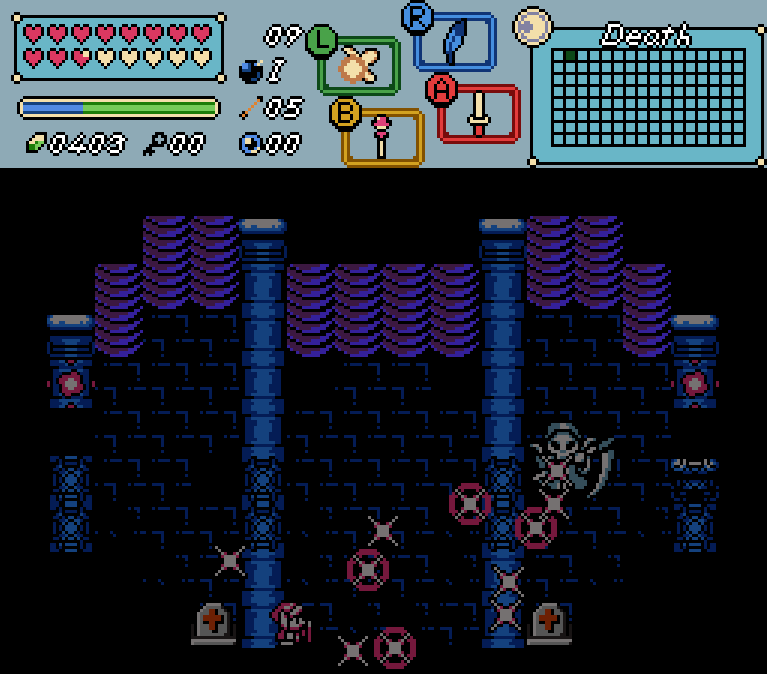 The areas also have different enemies. I even created a couple new ones myself. Nothing major, just things thst can be done in the enemy editor. The Death battle is going to be revamped, as is the final boss battle with Ganon. The final segment where you have to buy the sword and shield for the final dungeon is being changed. You will no longer have to buy them. Instead, there will be a new temple added to the overworld segment. I have spent about 5 days working on this and a lot is done. The entire Dungeon of the Fallen has been finished and tested. Personally. Some changes are still likely to be made. 1. Make a couple more bosses. 3. Choose/Customize new sprites for items. 4. Find/Reuse music for each area. 6. Attach item pickup messages to all items. 7. Do some story/lore related stuff. That's about it. This is pretty far along. But it will still be a while before it's done. Keep an eye on this. It is very important to me to get Lunar's approval on the quest before I release this also. So, while I do have his permission to work on this, I do want to let him look through everything. And if you want to check out the original quest, follow this link. Best of luck on this. Can't wait for final release. Thanks. Yeah, I can say that I have gone through 7 of the 10 areas in testing, and the only issues I am having is wizzrobes falling and the game starting you at the continue point of a DMap instead of the Continue Here screens after death. I can work with both of these things though. So, I finished off the overworld segment basically. Just have to make one more cave. Probably about 20 minutes of work. Then I need to plan and make the last two dungeons and bonus dungeon and make the story. Everything is world building and making sprite sort of stuff. I have an exam next week though, and some important school work coming up. So it may take a little time, but I am working on it.